Alright, already, enough teasing. Sorry for the delay...finally, here's a little giveaway for you! After yesterday's post, I got to thinking, maybe there are stitching gals out there for whom ORTS are a major issue. Maybe they're piling up, creating a little ort mountain on the arm of the sofa or on the table beside their sewing machine, or (horrors!) on the floor!!! Well, leave a comment on this post and you too, could manage those pesky little orts with this handy-dandy thread catcher I made with one of my favourite Japanese fabrics. Just think, no more multi-coloured cat hair balls! No more threads gnarling up that spinning-bar-thingy under your vacuum! 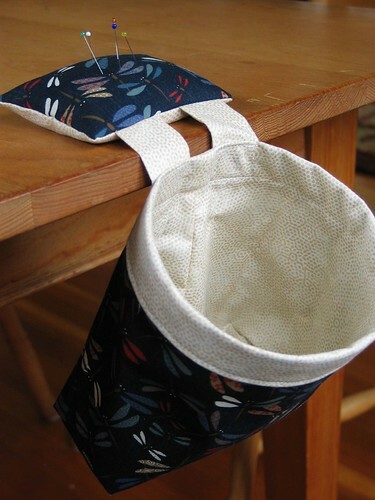 I'll even throw in a collapsible ort box for you and one for a friend that you can take along when stitching-at-large! I'm off on a quilting retreat for 4, count 'em F-O-U-R days on Thursday, so I'll leave the comments open on this post until Sunday night and announce the winner Monday, Nov. 9th. Anonymous comments are okay as long as you leave your email address in the little box where Blogger asks for it so I can get in touch with you. If you'd like to blab about my little giveaway on your blog, please do!, then come back and leave another comment to double your chances. Good luck! I love a giveaway! Found you thru Sew,Mama,Sew! Thank you. I had never heard of Orts until just the other day, now here I hear about them again. What a darling give-away. Thank you for this fun chance. I'm glad I'm not the only one to not know what orts were . I read about them in Country Threads a few months back but I haven't had a chance to use my new word anywhere , lol ! Love this, and so would my vacuum! :) Thanks for the chance to win! Very cute! Please add my name to the giveaway. I absolutely love that fabric--it is gorgeous. This is a great idea--I never thought about creating a container to put the threads in...I just pile them next to the sewing machine! Thanks for this giveaway! one can never have enough ort catchers! I keep one by my machine, but it would be so handy to have one at my side when I'm handstitchinbg upstairs, too! Gorgeous fabric you've used. Have fun at the retreat! Always thought orts referred to scraps of food. It is a great Scrabble word. Hope the retreat is fun. Great post on the Ort boxes Krista and a nice giveaway too! Now I have to gather some food orts for dinner! Love this! Right now I am using a mug to catch the orts. Your project is MUCH prettier. Hey, pick me. Postage to Alberta will be cheap! Oh yay, love this and sure need help catching my orts! How adorable ... I certainly could use one of those goodies. Please throw me into the pot. thanks. I have one of these already that was gifted to me and I love it! I've been using since April and not even close to half full! I love the thread catcher! And I definitely need one! Thank you for the giveaway! What a great idea ! My sewing room trash can has decorative slits in it...bad idea. My daughter and I would put this to good use. Thanks so much for the chance to win ! This would be something I could really use. My chair is leather and having a pincushion and thread bag hanging off the arm of the chair would be oh, so, convenient. Could I really use one of those thread catchers--that vacuum sometimes gets stubborn about picking them up off the carpet..... Could I be the winner??? I have put a link on my blog about your giveaway. Have a great time at the retreat. Hey, Great giveaway - got here through Abyquilt. Now I will go and read the rest of your blog. Boy do I need this! Actually what I REALLY need is one of those huge dumpsters that you find in alley ways....but alas...it won't fit in my sewing room! Your give away is so cute! Thank you for the chance to win it! Take care and have fun at the retreat! Gorgeous! I found you via SMS. Thanks for the giveaway! Great giveaway! I have put a link on my blog about your giveaway. This would be wonderful to win....I usually catch my ORTS on my shirt! I hope you have lots of fun! And what a great giveaway..
Have a great time at your retreat, they are the best aren't they. I go later this month with my group of fun fellow quilters. Thanks for the giveaway! I absolutely LOVE your site! Hope I win! I found you through Sew, Mama, Sew! and I'm definitely adding you to my "must-reads" for the day!